Driverless cars used to be the sort of thing you'd see in reel life, but today they are becoming real in real life. Steven Spielberg's "Minority Report" nailed the driverless car technology way back in 2002 with its futuristic Lexus-designed auto-piloted car. In one of the scenes, Tom Cruise decides to "run" from the authorities and sets off an exciting driverless car chase. Driverless cars used to be the sort of thing you'd see in reel life, but today they are becoming real in real life. Though driverless cars were once the reserve of science fiction, you can now buy a Tesla electric car or Lexus, BMW or Mercedes with an advanced autopilot mode, or head to Pittsburgh and hail a driverless Uber taxi. You can today also hail a driverless minibus in Switzerland or a driverless taxi in Singapore. Uber and Waymo are already offering automated taxi services in the USA. Ford has promised to bring fully autonomous cars by 2021. A driverless future may happen sooner than 2024, and it won't happen first in the U.S., Europe or Japan. China may be the first country where driverless cars go mainstream. That means police departments all over the world must get ready with new tactics and strategies to combat new types of violations and issues in the future. Autonomous cars would be game changers for freeing up parking spaces. Manually driven automobiles are being used 4 to 5 percent of the time while remaining idle 95 to 96 percent of the time. While, we can put the autonomous cars to non-stop use and as a result reduce the requirement of parking space. This could clear up an enormous amount of land in cities. For instance, 14 percent of the land in the city of Los Angeles has been designated just for parking. Such vast tracts of land freed up from parking could be used for creating more green spaces such as parks and for making cities more habitable. Autonomous cars would also reduce the cost of mobility, as there would be no need to own cars. Car ownership could mostly get replaced by sharing services such as taxis or pooled cars. There could also be an attendant reduction in the production of cars, leading to a dwindling of the automotive industry with environmental and monetary benefits. Ride-sharing services will also use autonomous cars because they will be cheaper than hiring drivers. Computers don't need days off and holidays, overtime, social security, or sick leave. The greatest benefit of the driverless car would be that it would require the user no longer to find a parking space. It's reported that a person on average spends 20 minutes looking for a parking slot, but driverless cars can save time and effort spent on parking. All one has to do is sit in the car, while the car drives one to the destination and drops the occupant. After which, the autonomous cars can find its assigned parking space all by itself. Driverless vehicles also require less space; Thereby, permitting cramming of vehicles in a limited area. For traffic, there could be an increase in highway capacity besides greater speed limits, decreased congestion, reduced need for safety gaps and smoother rides. A study estimated that autonomous cars could increase the capacity of roads by 273 percent. Such increments in highway capacity could have a substantial impact on traffic bottlenecks, especially in urban areas. This will also enhance the competence of traffic personnel to manage traffic flow, based on the data for driving behaviour predictability. Besides, there will be less requirement for road signage and traffic police. Safer driving because of automation will also considerably reduce the insurance costs. Automation could contribute to the improved fuel economy of the car because of reduced congestion and improved traffic flow. The onset of autonomous cars will bring a sea change in road safety. It's predicted that driverless cars will make our roads safer, as 94 percent of road accidents result from human error. Development of driverless technology according to McKinsey and Company could eliminate 90 percent of automobile accidents in the USA and prevent up to US$190 billion in damages and health-costs annually and save thousands of lives. Fully developing this technology will considerably lower traffic accidents caused by human error such as slow reaction time, tailgating, distracted and aggressive driving. However, autonomous cars require testing to establish their reliability towards safety. So far, self-driving cars have been safer than human drivers. For example, Google's driverless car Waymo as of February 2018 has covered over 5 million miles, during nearly six years of testing. And in all that time, it was found involved in fewer than a dozen accidents, none of which stemmed from a system's failure. 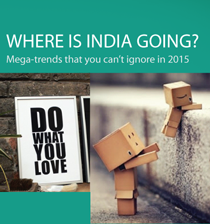 In India, over 1,50,000 people die each year in traffic accidents. That's about 400 fatalities a day, far higher than developed countries like the US, which in 2016 logged about 40,000. Widespread acceptance of automated cars would reduce the total number of accidents and fatalities which means a lesser number of police officers and men having to rush to or work at the road accident spots. A survey by the Eno Center for Transportation, a non-profit group, estimates that if 90% of cars on American roads were autonomous, the number of accidents would fall from 5.5 million a year to 1.3 million and road deaths from 32,400 to 11,300. Driverless cars would also drastically bring down the number of vehicles stops. In the USA Denmon & Pearlman's have estimated that around 800,000 drivers get pulled over every day by the police and autonomous cars could get rid of 56 percent of such stops. When it comes to fatal accidents, Tesla was the first to report a fatality in 2016 when the sensors of the car suddenly failed resulting in a collision with an 18-wheel truck killing the driver sitting behind the wheel of the car. Uber reported a road fatality by its driverless car in Tempe, Arizona, where it killed a pedestrian on March 18, 2018. The Indian Motor Vehicles Act 1988, lays down rules and regulates transport in India. The Indian Act does not recognise any form of transportation without a human behind the wheel. A human element is a prerequisite for any form of transportation. The law does not allow even for testing of driverless vehicles. Though the Motor Vehicles Amendment Bill, 2017 has recommended testing of driverless cars in India. It is yet to see the light of the day. Some countries have already introduced laws for the testing and operation of driverless cars. Autonomous cars could revolutionise policing. The AI-driven cars being intelligent could assist the police by informing the criminal behaviours of the passengers. Police could disable a car remotely if they know the vehicle is carrying a man, accused in a crime. Police would also be able to direct the car to lock its doors and drive itself to a police station. Automatic cars could have massive potential for mass surveillance, as police and intelligence would have access to enormous data generated by sensors, making anonymous travel difficult. Privacy could become a significant issue, as the system would integrate the automobile's position with an interface that connects to others. The threat of automotive hacking because of connectivity with a vehicle to vehicle and vehicle to infrastructure protocols would be huge. On the downside, autonomous cars could become tools in the hands of criminals as they could be used to crash into other vehicles or pedestrians. The FBI has already put "warning bulletin on VBIEDs" - (vehicle-borne improvised explosive devices), such cars can create a Pulwama autonomously without even needing a suicide bomber. In fact, we don't even need to wait for a future, some vehicles like Tesla Summon which are available in the markets, can already park themselves with no one inside and also drive itself to the owner waiting nearby. That's just enough time for a terrorist to plant an explosive device and walk away from it. Acceptance of automated cars would lead to loss of motor driving jobs leading to protests by driver unions intimidated by job losses. The motor insurance could suffer because of it becoming obsolete. A large number of drivers would grow unemployed. Automated cars would also render several jobs unnecessary. To safeguard employment, Union Minister for Transport Mr Nitin Gadkari has decided not to allow autonomous cars India at present has 30 lakh employees earning their bread in the automotive sector, introducing driverless vehicles either now or in future will cause a considerable amount of workforce to go out of employment impacting our economy adversely despite a scarcity of 2.2 million drivers at the moment in India. This may not be a valid argument for blocking a revolutionary technology. Because advent of Computers in India may have destroyed millions of jobs, but it created several million jobs for Indians worldwide, similarly introduction of washing machines in India made dhobis lose their livelihoods, but that didn't stop its debut when the time was ripe. Notwithstanding government policy, Tata has been working on driverless Tata Elxsi. The government now seems more focused on replacing fossil fuel dependent vehicles to the extent of 100 per cent with electric automobiles. 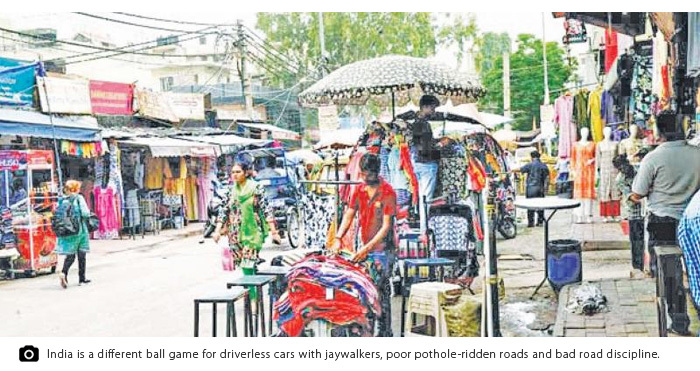 India is a different ball game for driverless cars with jaywalkers, poor pothole-ridden roads and bad road discipline. But the introduction of driverless cars in India, would enhance road safety and reduce road accidents and also positively impact pollution and carbon emission levels, fuel consumption, road congestion, and make transportation accessible to all including disabled. Autonomous cars are robots too, they can communicate, make decisions and also provide mobility. Can we make them spiritual as well? Can machines engage in a search for purpose and meaning that goes beyond every day and seek transcendent values? That doesn't seem possible, because for machines to be spiritual, they would have to become conscious, and have a sense of wonder like us.